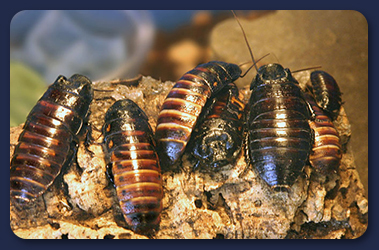 Cockroaches are largely tropical (warm-loving), night-time scavengers, that feed on dead animal matter in the wild. Many species living in Britain are introduced, and find suitable living conditions in warehouses, breweries, bakeries, and kitchens. In fact Cockroaches are common in most commercial premises associated with the production or handling of food. Also in domestic premises and public buildings e.g. blocks of flats. Nocturnal and very gregarious, they spend most the day hiding in crevices and crack around areas such as sinks, drains, cookers, the backs of cupboards and in refrigerator motor compartments. They particularly like premises that have complicated plumbing installations and service ducts. Cockroach infestations are typically introduced as egg cases or adults in incoming laundry, in crates and packaging, on raw materials, or arise as the insects enter buildings via such routes as drains or refuse chutes. The signs of a cockroach infestation is very often easier to spot than the actual pest itself. Almost all species of cockroach are nocturnal and prefer to remain hidden in crevices and cracks only coming out to feed on a night time. One of the most common signs of infestation can be an unpleasant odour that taints items that the cockroaches come into contact with. Another is their droppings which are cylindrical in shape and around 2mm long. These droppings are more prevalent if the insects have little or no water available in the area. Mature adults also shed their skin, usually very close to the area where they are sheltering at night.